A Highland single malt today, from my “I wonder where this came from” pile – everyone has piles like that, right?! 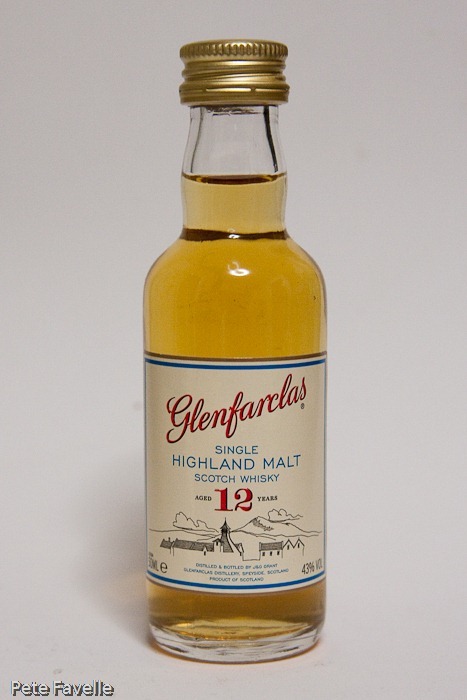 I have to confess I’ve not really come across Glenfarclas before; I’m not sure that’s any criticism of the whisky – more likely that my Islay obsession has blindfolded me to a lot of other brands. On the other hand, I’m tasting with no preconceptions which is probably a good thing! It’s a nice pale gold in the glass. The nose has a nice warmth to it, hints of old wood and biscuit. With a splash of water there’s more sweetness evident, and a hint of dark fruits. The taste is intriguing; there’s sweetness in there and some spice too, along with a hint of rich fruit underneath. That fruit comes more to the fore with water added, with a nicely balanced, rich body that doesn’t linger too long. It’s not my normal style of whisky, but it’s pretty tasty and I’ll certainly keep an eye open for their other expressions. Ha, it was in a goodie bag I bought home from a very wonderful dinner with some very lovely people!